This Russian shirt is designed in an old patchwork style. The cute shirt is made of linen blend. Traditional Russian shirts offering best of Russian folk traditions. This design is great for theatres, shows and other stage performances. 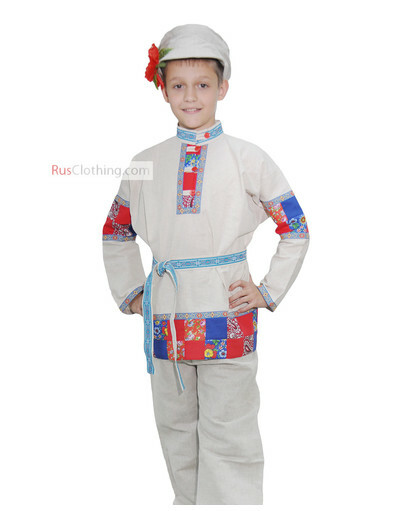 The Russian peasant shirt looks great with the kartuz headwear. Highlighted with bright patches and embroidered ribbons, the Russian shirt can be worn with or without belt. Ethnic touch will add special charm to your boys look. This Russian shirt is individually made, not factory mass produced.